Hillbilly Elegy: A Memoir of a Family and Culture in Crisis is a memoir by J. D. Vance about the Appalachian values of his Kentucky family and their relation to the social problems of his hometown of Middletown, Ohio, where his mother's parents moved when they were young. Vance describes his upbringing and family background in a family from a small town in Ohio. He writes about a family history of poverty and low-paying, physical jobs that have since disappeared or worsened in their guarantees, and compares this life with his perspective after leaving that area and life. Vance was raised in Middletown, Ohio, though his ancestors were from Breathitt County, Kentucky. Their Appalachian values include traits like loyalty and love of country despite social issues including violence and verbal abuse. He recounts his grandparents' alcoholism and abuse, and his unstable mother's history of drug addictions and failed relationships. Vance's grandparents eventually reconciled and became his de facto guardians. He was pushed by his tough but loving grandmother, such that Vance was able to leave Middletown and ascend social ladders to attend Ohio State University and Yale Law School. Alongside his personal history, Vance raises questions such as the responsibility of his family and people for their own misfortune. 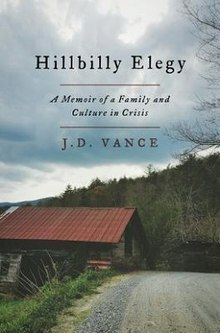 Vance blames hillbilly culture and its supposed encouragement of social rot. Comparatively, he feels that economic insecurity plays a much lesser role. To lend credence to his argument, Vance regularly relies on personal experience. As a grocery store checkout cashier, he watched welfare recipients talk on cell phones although the working Vance could not afford one. His resentment of those who seemed to profit from poor behavior while he struggled, especially combined with his values of personal responsibility and tough love, is presented as a microcosm of the reason for Appalachia's overall political swing from strong Democratic Party to strong Republican affiliations. Likewise, he recounts stories intended to showcase a lack of work ethic including the story of a man who quit after expressing dislike over his job’s hours and posted to social media about the "Obama economy", as well as a co-worker, with a pregnant girlfriend, who would skip work. The book was popularized by an interview with the author published by The American Conservative in late July 2016. The volume of requests briefly disabled the website. Halfway through the next month, The New York Times wrote that the title had remained in the top ten Amazon bestsellers since the interview's publication. Vance credits his Yale contract law professor Amy Chua as the "authorial godmother" of the book. The book reached the top of The New York Times Best Seller list in August 2016 and January 2017. Journalists wrote that the book was of specific importance during the 2016 United States presidential election, as Vance compassionately describes the white underclass who fueled the campaign of Donald Trump and a resurgence of outsider politics. Conservatives expressed admiration for Hillbilly Elegy, particularly The American Conservative contributor and blogger Rod Dreher, who said that Vance "draws conclusions…that may be hard for some people to take. But Vance has earned the right to make those judgments. This was his life. He speaks with authority that has been extremely hard won." However, the following month, Dreher posted about why liberals loved the book. New York Post columnist and editor of Commentary John Podhoretz described the book as among the year's most provocative. The book was positively received by conservatives such as New York Times op-ed columnist Ross Douthat, National Review columnist Mona Charen and National Review editor and Slate columnist Reihan Salam. By contrast, liberal commentator Jared Yates Sexton of Salon criticized Vance for his "damaging rhetoric" and endorsing policies used to "gut the poor." He concludes by accusing Vance of racism and white privilege, saying he "totally discounts the role racism played in the white working class's opposition to President Obama." Sarah Jones of The New Republic mocked Vance as "the false prophet of Blue America," dismissing him as "a flawed guide to this world" and the book as little more than "a list of myths about welfare queens repackaged as a primer on the white working class." The New York Times wrote that Vance's direct confrontation on a social taboo is admirable regardless of whether the reader agrees with his conclusions. The newspaper writes that Vance's subject is despair, and his argument is more generous in that it blames fatalism and learned helplessness rather than indolence. A 2017 Brookings Institution report noted that Hillbilly Elegy was a "raw, emotional portrait of growing up in and eventually out of a poor rural community riddled by drug addiction and instability." Vance's account anecdotally confirmed the report's conclusion that family stability is essential to upward mobility. ^ a b c d Senior, Jennifer (August 10, 2016). "Review: In 'Hillbilly Elegy,' a Tough Love Analysis of the Poor Who Back Trump". The New York Times. Retrieved October 11, 2016. ^ Heller, Karen (February 6, 2017). "'Hillbilly Elegy' made J.D. Vance the voice of the Rust Belt. But does he want that job?". The Washington Post. Retrieved March 13, 2017. ^ Barro, Josh (August 22, 2016). "The new memoir 'Hillbilly Elegy' highlights the core social-policy question of our time". Business Insider. Retrieved March 13, 2017. ^ "Combined Print & E-Book Nonfiction Books – Best Sellers – January 22, 2017". The New York Times. Retrieved February 12, 2017. ^ Dreher, Rod (July 11, 2016). "Hillbilly America: Do White Lives Matter?". The American Conservative. Retrieved March 22, 2017. ^ Dreher, Rod (August 5, 2016). "Why Liberals Love 'Hillbilly Elegy'". The American Conservative. Retrieved March 22, 2017. ^ Podhoretz, John (October 16, 2016). "The Truly Forgotten Republican Voter". Commentary. Retrieved March 12, 2017. ^ "Ross Douthat on Twitter: "Read @roddreher on J.D. Vance's "Hillbilly Elegy": "". Twitter. Retrieved March 22, 2017. ^ "Hillbilly Elegy: J.D. Vance's New Book Reveals Much about Trump & America". National Review. July 28, 2016. Retrieved March 22, 2017. ^ "Reihan Salam on Twitter: "Very excited for @JDVance1. HILLBILLY ELEGY is excellent, and it'll be published in late June:"". Twitter. April 30, 2016. Retrieved March 22, 2017. ^ Jared Yates Sexton (March 11, 2017). "Hillbilly sellout: The politics of J. D. Vance's "Hillbilly Elegy" are already being used to gut the working poor". Salon. Retrieved March 22, 2017. ^ Jones, Sarah (November 17, 2016). "J.D. Vance, the False Prophet of Blue America". The New Republic. Retrieved March 22, 2017.